On Sunday, November 15, 2009, I was playing recreational volleyball and soccer in my backyard with a group of about 15 friends ranging from ages 13 - 50. We had been playing volleyball for about 2 hours and then decided to switch to soccer. About 30 minutes into our soccer game, the goalie sent a long pass to me that I had to really reach with my dominate right leg. I remember my foot making contact with the ball and then my whole body making contact with the ground as something major snapped in my right knee. My leg felt paralyzed as I lay on the ground surrounded by nervous spectators. My MRI showed a complete tear of the ACL. After learning my options, I immediately opted for the reconstructive surgery. Being athletic for all my life, having to stop playing all the sports like soccer, volleyball, tennis, rock climbing, and ultimate Frisbee that I loved at the age of 45 was not an option. I wanted to do more than continue running road races; I wanted to continue my life. If I had to give up all my sports and outdoor activities at such a young age, I might as well stop living. My surgery was scheduled for January 14, 2010, so for the next eight weeks, I went on a very aggressive plan for pre-surgery therapy. By the date of my surgery, I had run two 5k races and a five miler; been doing weight training at my PT's and in my home gym for strengthening all my muscles surrounding my knee; and had all my friends questioning why I needed any surgery. This is where my story really begins. I'm sitting today, February 25, 2010 at 41 days or 6 weeks into my recovery, and I can't get past a 107 degree bend. On the days I can get to around a 105 degree bend; I am also pushing to my maximum pain threshold. My PT usually makes me stop for fear of me passing out. after my surgery. The rest of the time I just took Ibuprofen mainly for swelling. By day 14, all my range of motion progress halted. For the past four weeks, I've made absolutely no progress in my range of motion, and I still have to use one crutch a lot of the time. I can tell that something isn't right, but my PT and I can't figure it out. * My knee will swell and become hard as a rock if I stand still for over ten minutes say cooking in my kitchen. I have to ice it and sit down for a while until the swelling subsides to where I can partially bend it again. * When I do push past 90 degrees, the inside of my knee starts feeling like someone poured acid into the cavity. This pain is what honestly stops my range of motion the most. I have a very high pain threshold and will get myself up to an 8 before I stop pushing for fear of passing out. * Probably most frustrating and unexplainable is my knee locking. When I first begin my range of motion stretching at PT, my knee will begin to lock at around 50 degrees. I'll have to work it, massage it, and gently bend it back and forth until it unlocks and lets me get past 50 degrees. What in the world it making it catch inside? Besides all these odd issues, I can tell I'm getting stronger. I can perform straight leg raises and have been able to since day 10. I can do a full rotation on the stationary bike. I'm doing wall squats, hamstring stretches, along with front, side, and back leg raises all in the aquatic pool, but I have very limited range of motion. 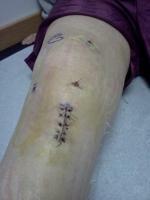 When I read timelines of ACL reconstructive recovery, I get even more frustrated about what I can't do. I'm barely able to walk without a crutch, I can't do stairs, I can't drive, and my knee locks up constantly. What could be wrong? Thus, the current story of a very frustrated ACL surgery patient looking for advice or answers.